​Recently, a large gathering of members were challenged to dream big and think of what they would like to see at St. Paul’s in ten years. Some ideas were ministry benchmarks and school body related, and some were physical and practical. 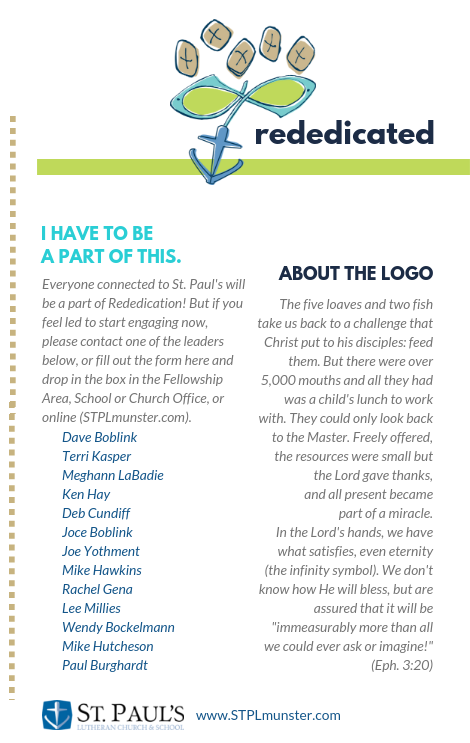 In the end, we can’t do them all right away, but we can start to re-energize the body of Christ by working on those necessary upgrades to the campus that benefit younger families, the handicapped, and the elderly, and also foster a more inspiring environment and first impression for visitors and potential members. • An atrium entryway to the Narthex that includes more bright Fellowship space, a covered drop-off area at the entrance, and new and safer handicapped parking and school drop-off areas, demonstrating that everyone counts and each individual’s relationship stems from what happens in the sanctuary. • Upgraded interior Fellowship area renovation with more efficient use of space, inviting furniture, better lighting and artistic focal features, access from the Prayer Garden, while paying homage to the most-loved historic pieces from our past; renovated main restrooms are included. Reorganizing entryways, environments, and Fellowship possibilities underscores the value of relationships we have in Christ to old and new friends. • An outdoor chapel/pavilion with firepit to expand our use of the grounds, connect the church and school ministries internally and connect St. Paul’s as a whole to the community with an attractive and useful space for ministry to youth, school, and families. • Reimbursement to the Endowment for the recent necessary updating of the HVAC as responsible stewardship of the building we inherited and hope to bequeath to the next generation in healthy and beautiful condition. The target goal is $1.5 million which is both feasible and challenging. 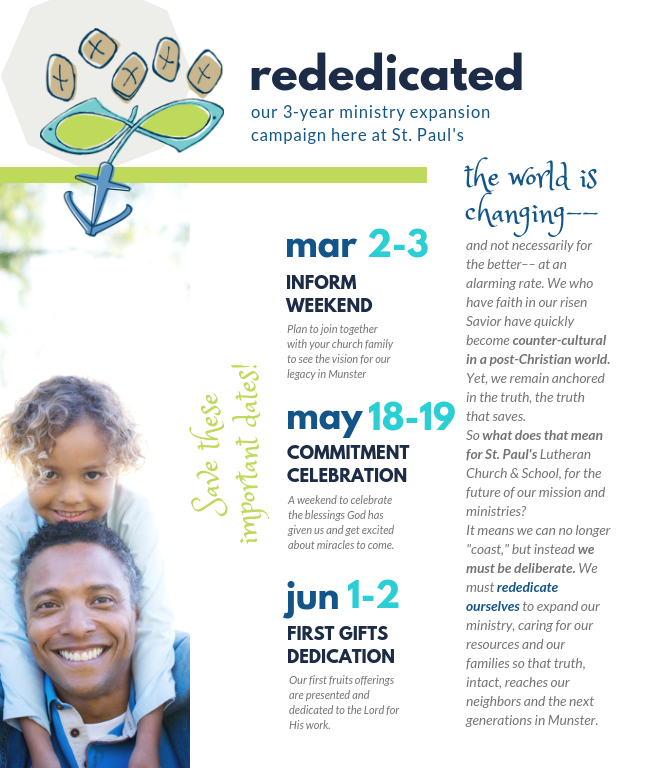 In the end, we actively and earnestly pray that God uses the campaign to bless the church family at St. Paul’s with expanded evangelism and discipleship, increasing the body of Christ in church and school. The physical changes to the campus will mean little without a rededication to the Gospel and changing the hearts of her members. I have a certain set of skills...How can I help?